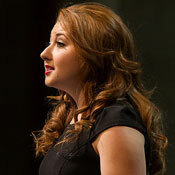 Although Visiting Assistant Professor Angela Kocze never met Dr. Maya Angelou, she has always felt a certain connection with the poet, author and civil rights activist. “The way she talked about humanity and bringing together all kinds of people from various places resonated with me,” Kocze said. In the spirit of bringing people together, Kocze invited Wake Forest students, faculty and members of the Winston-Salem community to the Southeastern Center for Contemporary Art (SECCA) for an evening event, “Celebrating Maya Angelou.” Attendees gathered in SECCA’s new gallery area to honor Angelou’s legacy through readings of her poems and shared memories of her life at Wake Forest. The author, poet and Reynolds Professor of American Studies died in 2014 after teaching at the University for more than three decades. “I really wanted to have an event where we could have different communities come together and start a dialogue,” Kocze said. The idea for the celebration began with Kocze’s students. During the fall semester, Kocze taught a course on Researching Feminism, Social Justice and Public Engagement. She wanted her students to do more than just discuss social research and hoped that the class would be an opportunity for students to put qualitative research methods into action. In teaching her students about various methodologies such as interviews and oral histories, Kocze had her students focus on Angelou. 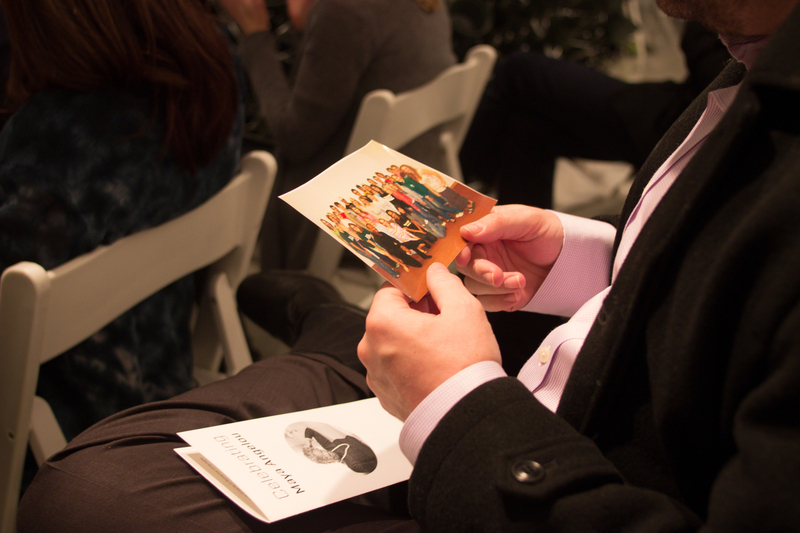 An audience member looks at a photo of the students in the last “World Poetry in Dramatic Performance” class Angelou taught. 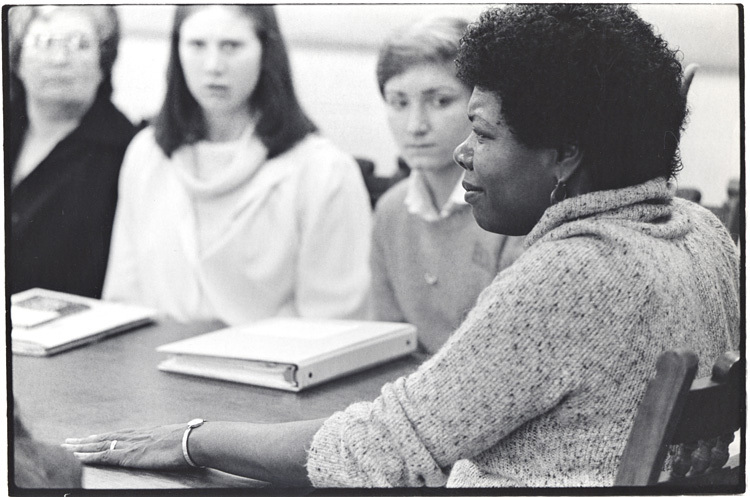 Over the course of the fall 2014 semester, her students examined Angelou’s presence at Wake Forest and in Winston-Salem. Kocze split her students into two groups. One group researched Angelou’s political activism and community involvement, while the other examined records of her teaching at Wake Forest. Both groups interviewed those who knew Angelou. Freshman Bryant Gross-Armiento was one of the students who spoke with the members of Mount Zion Baptist Church, where Angelou was a long-time member. The students’ research findings were compiled into portfolios containing interviews, stories and images that will be donated to the Z. Smith Reynolds Library Special Collections. Kocze hopes that her students will reflect positively on their experience. Gross-Armiento hopes that the class’s research can serve as a teaching tool in the future. As the class came to close, Kocze wanted a way to continue the discussion about Angelou’s legacy and looked for opportunities for public engagement. Inspired by her students’ work, she decided to organize a celebration of Angelou in collaboration with SECCA, the Department of Women’s, Gender and Sexuality Studies, the Pro Humanitate Institute, IPLACe and the Humanities Institute. Throughout the celebration, various members of the Wake Forest and Winston-Salem communities talked about their relationship with Angelou and read her poems—often in different languages. Wake Forest junior Xueer Lu recited “Still I Rise” in Chinese and senior Tiffany Virgin, who leads Wake Forest’s Can-I-Poet group, read excerpts from “On the Pulse of Morning” in Spanish. Thomas Mullen shared the story of Maya Angelou’s first visit to Wake Forest in 1973 and the three-hour conversation with students that followed her formal talk. Mullen was dean of the College at that time and instrumental in bringing Angelou to Wake Forest a few years later as Reynolds Professor of American Studies. Provost Emeritus Ed Wilson and professor of theater Cindy Gendrich shared personal reflections and read poems. Wilson chose Angelou’s poem for children called “Life Doesn’t Frighten Me” and Gendrich chose a Shakespeare sonnet that inspired Angelou when she was growing up in Stamps, Ark. Kocze is glad that she succeeded in both teaching others about Angelou and bringing together people from all walks of life.